First of all a huge thank you from me [sHyLoCk] and Will [willxtreme] for your support,suggestions, feedbacks regarding ArchBang. We now have a little problem. Although it is not going to disrupt the project in anyway,in-fact it will do the project good! Larger upgrades = More chance of breakage! 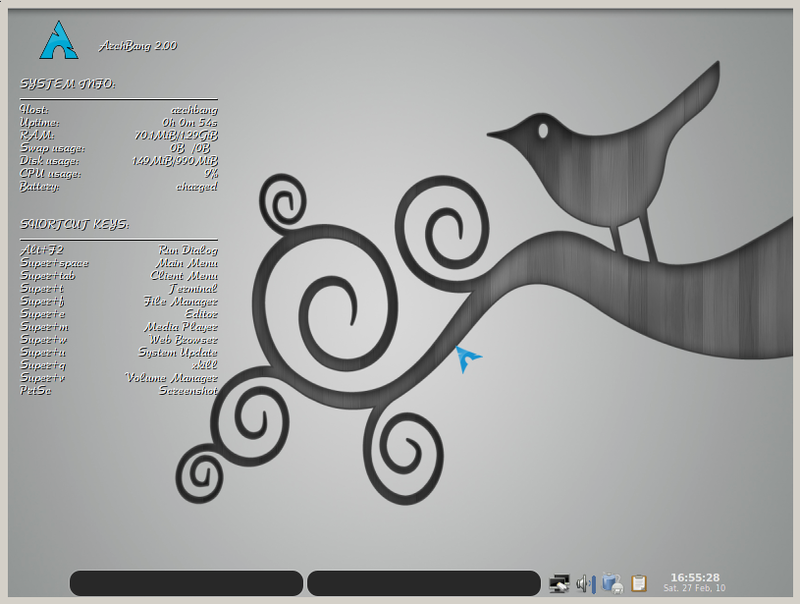 Provides a Live Desktop Environment to Arch Linux. Installable since 2.00.Although only RC1 is out now. 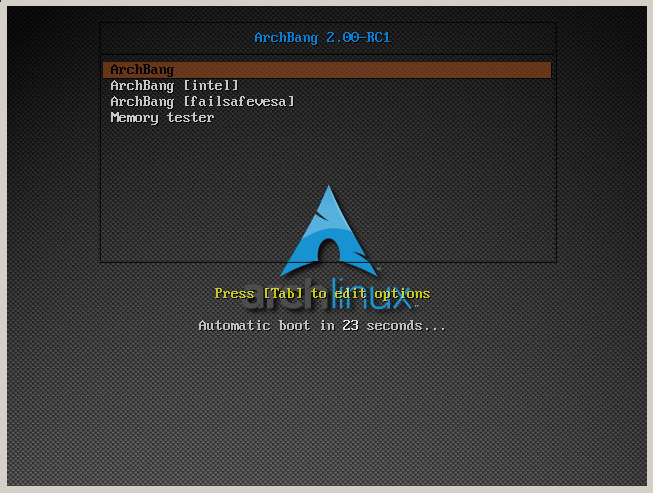 The installer is the simple Arch Linux installer. Very fast and light being based on Arch and openbox, can be even copied to RAM and used. So far we have 6 members in our team. 2 of whom help us with hosting.While Mr.Green and akurei have offered help we need more developers! The reason again being the darn time factor as akurei also will be busy in a few months. If you would like to help out in our project please leave a comment here along with your email address in this format [name at email dot com] to avoid spammers! If you know my email address or you are a member of ArchLinux forum then you can mail me, remember mail me [sHyloCk] and not Will [willxtreme]! He is very busy and offline for a while and won’t be able to reply you! You should have knowledge about Arch Linux. Developing is not a challenging thing as it sounds, as long as you know a little bash and unix. As a developer you will decide what goes where and how to do things better! As a documentation writer your task would be to write README and CHANGELOG files for each releases and also to announce in various places. It would be awesome to have a website of our own like ArchServer does the Arch Linux style,but no clue how to do that! Anyone? ArchBang 1.04 is out in the wild both 32bit & 64bit versions! -We went “lite mode” by stripping off packages so the iso just 445MB [x86] and 464MB [x64]. ENJOYYYYYYYYY and give us your feedback! And there’s now a wiki entry. 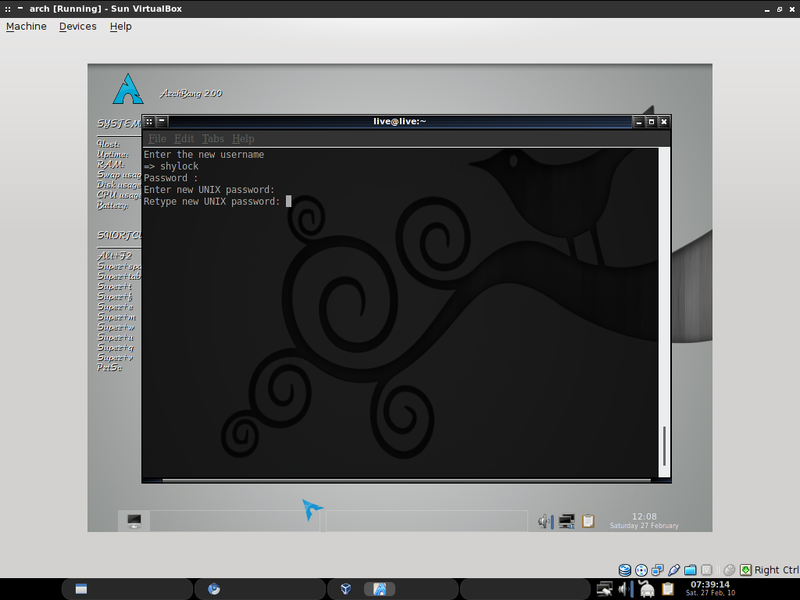 ArchBang LIVE CD = Arch Linux w/ OpenBox (inspired from #!) so ArchBang!!! My contribution: Building the x86_64 version. Currently we are planning on 1.04 release where we want to present an installer. So, for now it’s just a Live CD which you can use in USB Key as well. Please read the thread to know how to do that! Download 32bit and/or 64bit .